Very few contemporary artists depicted events that occurred around 1916. There are many photographs showing the aftermath of the Easter Rising but very few that were actually taken inside the GPO or other areas of Volunteer action. Michael Barry, through extensive research, has put together the sequential story of a momentous week through a collection of well-known and rare depictions to illustrate the history of the 1916 Rising. He has supplemented these with photographs of some of the locations as they are today. Many books have been produced to commemorate the centenary of the Easter Rising in 1916. This book will stand out as it gives a pictorial account of the 1916 Rising, an event which subsequently changed the lives of Irish people forever. The title of the book is taken from the last dispatch, from James Connolly (1868-1916). to the “Army of the Republic” when he said “Courage boys, we are winning…never had a man or woman a grander cause, never was a cause more grandly served.” The well-known picture Birth of a Nation by Walter Paget (1863-1935) shows a vivid depiction of Connolly and other leaders of the Rising, amidst the desperate scene in the General Post Office (GPO) before the building was evacuated, and underlines how tenaciously the Volunteers fought to the end, against heavy odds (p.124). The book intersperses contemporary photographs from 1916 with pictures of the same locations today. The book is divided into four parts. In the first part, Barry gives a brief overview of Irish history from the 1700s, a time when Ireland had become “the perfect colony under the British crown,” up to the 1916 Rising. The genesis of the Rising includes the complexities of the time, when many Irishmen joined the British Army. They did this at the urging of John Redmond (1856-1918), leader of the Irish Parliamentary Party. Redmond saw support for the British in World War 1 as a means of implementing the suspended Home Rule Act. Nationalists, on the other hand, saw this as traitorous and worked towards the goal of an Irish Republic. While Unionists were arming against Home Rule, Nationalists were also arming, for example at Howth in 1914 and the failed attempt at Banna Strand, Co. Kerry in 1916. Sir Roger Casement (1863-1916) was instrumental in both of these endeavors which are illustrated through a telescopic view, by Robert Ballagh (b.1943 -), of Molly Childers (1875-1964) and Mary Springer-Rice (1880-1924) landing the Asgard at Howth (p.34), as well as several depictions of Casement, the Aud and German U-Boats. The second part describes events from Monday 24 April to Wednesday 26 April 1916. On the Monday, an Irish Republic was declared, when Padraig Pearse (1879-1916) read the Proclamation of the Republic, in front of the GPO. The key locations held by the Volunteers are detailed as well as the attacks and counter-attacks by British soldiers. One of the illustrations shows a rare sketch of British soldiers attacking Volunteers in Mount Street (p.106). They are shown approaching from the right-hand side although the author says that they actually came from the opposite side. There is also a very stark photograph of the grim spot where Francis Sheehy-Skeffington (1878-1916), along with two others, was shot in Cathal Brugha Barracks (formerly Portobello Barracks) (p.89). The final stand and surrender is outlined in the third part which took place between Thursday 27 April and Sunday 30 April 1916. During this time, Dublin was flooded with 10,000 British troops who were well-armed and had what look like makeshift, but clearly effective, small tanks (p.127). A very rare photograph, taken inside the GPO by Joseph Cripps, shows the variety of age groups, uniforms and weapons of the Volunteers (p.119). The odds were against the Republicans who numbered approx. 1,400. All of the main flash points are outlined, such as Percy Place, Mount Street, Bolands Mills the Four Courts, North King Street, Church Street, Rialto Bridge, Marrowbone Lane, South Dublin Union, St. Stephens Green, Jacob’s factory, GPO, Mendacity Unit, Parnell Street and Moore Street. The photograph of Padraig Pearse surrendering to Brigadier General Lowe is intriguing as Pearse was accompanied by Nurse Elizabeth O’Farrell (1884-1957). While she has been air-brushed out of the photograph, her feet and long skirt are still visible (p.155). Elizabeth O’Farrell was famously air-brushed out of the photgraph of Pearse’s surrender. The Proclamation of the Republic was addressed to the men and women of Ireland and women played an important role in the Rising, albeit largely unsung and unrecorded. It would be interesting to know what their reaction was to the alterations made to this particular picture. Another depiction that stands out shows a burning O’Connell Street with two British tanks scurrying along O’Connell bridge (p.128). The final part covers retribution and remembrance which includes some spectacular pictures of a devastated O’Connell Street. As the Republican outposts surrendered, Dubliners took stock of their shattered city. Court marshals were set up and the leaders of the Rising, as well as others involved, were executed and hundreds more imprisoned. While the Volunteers were jeered at as they were marched into captivity, there was a change of mood among the population after the executions. A large picture (artist unknown) shows a scene, in the Stonebreaker’s Yard at Kilmainham Jail, where a blind-folded Volunteer is being shot while a Capuchin priest prays by his side (p.180). The Sir John Lavery (1856-1941) painting High Treason, depicting the trial of Sir Roger Casement also stands out (p.190). It is a pity that more space was not given to the painting the Surrender of the Irish Citizen Army at the College of Surgeons by Kathleen Fox (1882-1963). This is one of the few contemporary depictions by any artist of events during 1916. It shows the scene, witnessed by Fox, of the arrest of Countess Constance Markievicz (1868-1927) and Michael Mallin (1874-1916) in front of the College of Surgeons (p.162). The book is based on a considerable body of research and many of the illustrations will be new to many people. The Easter Rising led to the War of Independence, the Civil War and ultimately the Republic of Ireland. While continuing controversies are discussed in relation to these events, learning about how our independence was achieved is essential to reaching an understanding of the foundation of the Irish State. The events of 1916 also had an impact outside of the country. Ireland, “the perfect colony under the British crown” was the first country to break free from the British Empire, an example which other countries subsequently followed. It is difficult to decide at whom this book is aimed. It could be of interest to people who know a lot about the 1916 Rising but are not familiar with visual images etc. of the relevant locations. It could be of interest to people who do not know a lot about the 1916 Rising and who wish to get a general overview of events. Either way, the book is based on a considerable body of research and many of the illustrations will be new to many people. The author has referenced several books to read, should one want to learn more about the Easter Rising in depth. Hopefully this book will prompt readers to do just that. Patricia Curtin-Kelly is a Cork born Art Historian who lives in Dublin. She holds an M.A. from University College, Dublin in Art History and an M.Sc. in Human Resources Management from Sheffeild Hallam University. Her book, An Ornament to the City – Holy Trinity Church & the Capuchin Order was published by the History Press in 2015. 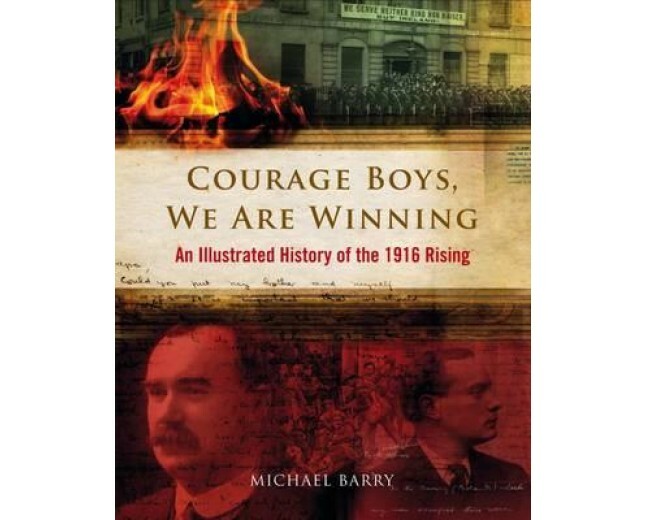 2 Responses to "Book Review: Courage Boys, We Are Winning – An Illustrated History of the 1916 Rising"
I liked his Civil War book. Many old pictures I hadn’t seen, interesting modern pictures, and good text. So I’m looking forward to reading this one, too. I am curious as to whether the British authorities took photos of the rising’s leaders as part of identifying and processing the men before their court martials and executions. If such photos exist, I would suspect they would have an intimacy for a contemporary audience that is missing in the well-known studio portraits.